Choosing a new dishwasher presents its own issues in today’s market; with so many brands and over 500 models to choose from, how do you know which one is right for you? 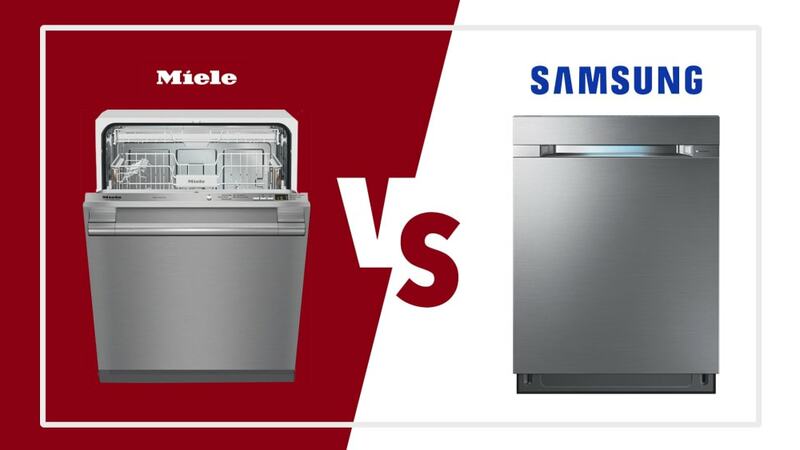 In this article we are going to review everything you need to know about Miele and Samsung dishwashers; both highly reputable brands that deliver a level of perfection into your kitchen. Let’s start by looking at the history behind these two brands as it relates how they deliver value to customers. Founded in 1899, Miele is a family owned German manufacturer of high-quality appliances. Miele is focused on "setting unmatched standards of durability, quality, and performance". Therefore, you will not find a Miele on the shelves of big box home improvement stores that advertise low-cost, cheaply made products from run of the mill mass manufacturers. With 90 years’ experience in making quality dishwashers, Miele is able to tout a 20-year longevity; something that other manufacturers cannot. This is certainly a great selling point for their loyal global customer base. While the initial price of their models may be higher, investing in one will cost you far less in the long run if you consider that you will need to upgrade every five years or so when choosing another brand. Occasionally, we receive calls from our customers asking why there are water spots in their new dishwashers. Our answer is simple - each Miele dishwasher is tested before getting into the delivery box. As a company that ranks sixth for the highest global brand value, Samsung dominates today’s market for televisions, mobile phones, tablets, and appliances. Today, Samsung has an ever-growing share of more than 20% in the US home appliances market. Samsung differentiates itself from competition (GE, Whirlpool, LG etc.) by their commitment to progress at a breakneck speed. Samsung dishwashers are no exception to this. You will find many features from competitors incorporated into Samsung dishwashers and then some. Samsung dishwashers generally appeal to customers who are ok with getting a maximum of 7 to 10-year longevity. However, what Samsung gives up with longevity is made up by their great price points and sleek finishes. Miele makes over 50 residential dishwashers as well as several professional use models that many restaurants and medical offices come to depend on. Price points on Miele dishwashers range from $899 to $2,899. Samsung, on the other hand, has less than 15 models including color combinations. Samsung prices range from $395 to $1,074 before seasonal promotions. Due to the varied focus on market segments and quality commitments, it is not possible to do an apples to apples comparison between the two brands and their individual models. Therefore, we approached this comparative review from the perspective of a modern user who needs to have a quiet dishwasher which is able to wash and dry dishes. You can find detailed review articles on each brand in our previous posts (which we update regularly). As an example, our buying guide for Miele is a definitive piece which covers all features of Miele dishwashers. As for Samsung, we demystified their marketing language and went over all models and features in our in-depth review. What do we expect from a modern dishwasher? Once upon a time, we planned our lives around the dishwasher cycle as we couldn’t bear to be in the same vicinity due to the noise, especially if you had an open plan kitchen. Chatting with our family was frustrating, we couldn’t hear the TV, and even the pets seemed to make themselves scarce while the cycle was on. These days, having super quiet machines are a huge selling point for dishwasher manufacturers, and the competition is on as to who can make the quietest model. Wouldn’t it be great to have a dishwasher that you can put on at any time of day or night, and not have to worry about the noise? Both Miele and Samsung have solved this issue. They are certainly giving other brands a run for their money. So, just how do you know if a dishwasher is adequately quiet when you are researching? A dishwasher’s noise level is rated in decibels (dB or dBA). If you can imagine that a quiet library is 40 dB, a regular conversation is 50 dB, and a crowded restaurant chatter is 60 dB, you are not going to have your favorite TV show disturbed or your kids distracted from their homework at anything under 50 dB. As a rule of thumb, a dishwasher between 38-45 dB is going to be super quiet. However, we also don't think 46 dB to 49 dB is a bad place to be, especially considering the loudest part of a cycle is during water intake and discharge which are infrequent actions during the wash cycle. When looking at Samsung models, they all operate at a noise level of between 38-50 dB, except for the entry-level models at 55 dB. This means that you can have a good night sleep or enjoy time with your family without any pesky noise disturbing your peace. Most of the Miele models have a 39-46 dB level. You will hardly notice a Miele dishwasher working. You will certainly be able to get on with your usual activities without any headaches. While both brands stand out in the market for this quietness, it is Miele that has offers a larger selection of super quiet models. Gone are the days of ugly white dishwashers that stood out like a sore thumb, as when it comes to design, both brands offer sleek designs for contemporary kitchens. which enables you to literally gently knock open the door. In addition, it is worthwhile to note that Miele has by far the best fingerprint-proof coating in the market which they call "Clean-touch". On the other hand, Samsung is a brand that dominates almost every spot in our homes, with well-designed televisions, washing machines, cell phones, and fridges. Their dishwashers are no exception, and we particularly like the black stainless-steel models that are ready to roar just like a brand new shiny convertible. We also appreciate the blue led light indicator that adds value to design as well. Having a range of wash cycles to choose from is important as you know that each load you put on is going to differ in terms of the size, the types of dishes you have, and how dirty they are. Samsung keeps it simple even on their high-end models, with only seven cycles and seven options for each of these – you’ll only get four on basic models. On the other hand, Miele gives you up to 14 cycles with seven options under each cycle. What is good to know, is that both brands include express cycles, and you can also find sanitize, pots and pan cycles, and intensive wash cycles in most dishwashers. The white plastic tubs that were used in the older dishwashers used to drive us crazy when they discolored. Thankfully, we no longer have to worry about this problem with both Miele and Samsung offering stainless steel interiors in all their dishwashers. This means no discolored interior, and the steel also ensures that dishes come out dry. Miele offers luxurious interior lighting inside their higher up models. If you know the feeling of your dishes not coming out sparkly clean because you chose the wrong wash cycle, then you’ll be pleased to know that most modern dishwashers have a sensor that can detect the clarity or murkiness of the water in order to adjust the wash duration. However, only Miele dishwashers take three water measurements during the washing cycle and will automatically decide how the program duration, water level, and water pressure need to change. North American dishwashers commonly include heating elements, and while they dry dishes well, they can, unfortunately, bake on food or calcium onto dishes. Plus, you have the risk of plastic items melting, especially if they are on the lower rack. To avoid these issues and to protect the environment through energy efficiency, both Samsung and Miele use condensation drying, where moisture is absorbed by the stainless-steel walls and washed down. Miele takes this one step further and incorporates the ability to circulate ambient air to absorb remnant moisture. As you go up in the value chain of Miele you will get more intense drying options. Having an auto open-door feature in your dishwasher means that you can put your dishwasher on before you go to bed and wake up to clean and fully dry dishes in the morning. Having the door slightly ajar for some time after the cycle finishes means that the steam can dry up and there are no musty smells inside the dishwasher. This feature is commonly found in all Miele dishwashers apart from the entry-level Classic series, and on all Samsung dishwashers above 80K7050. The addition of a third rack in the top of a dishwasher to be used as a cutlery tray was an invention that Miele brought to the market. Having this feature is really helpful when it comes to saving space in the bottom rack and makes loading and unloading cutlery a lot easier. The third rack that you will find in the Miele models are super flexible and enable you to put long-stem wine glasses on the rack below. Miele uses a full-length spray arm on top of the dishwasher to clean silverware on models with a 3rd Rack. While you’ll also find a third rack in mid-level and above Samsung dishwashers, they are not as flexible as the ones you’ll find in Miele. However, FlexTray is a nifty feature for Samsung as it truely helps with unloading time. Both brands include a leak prevention feature, where the water source is shut down if leaks are detected. This is a superb function that means you will not have to worry about floods occurring in your kitchen. Miele takes this feature farther by supplying even their hoses with leak detection capability. This feature softly closes the dishwasher door if it is left ajar, but is only exclusive to Miele Diamond series. If you are in a neighborhood that has hard water, such as New Jersey, having a water softener feature is really important. This ensures that you get crystal clean glassware without any spots since the water softeners help combat calcium residue. You’ll find this feature on all Miele dishwashers that are in the Crystal series or above, but, unfortunately, we can’t find it in any Samsung models. Shall I be Worried About my China and Crystals? Putting fine dishes and glassware into your dishwasher can often make you nervous and have you wondering if they are going to come out in one piece. Thankfully, you can trust Miele with these precious items as both have models that include dedicated china and crystal cleaning features. With Samsung, any of the 80K5050 series and up are suitable for fragile items, but Miele has a lot more to offer. The Miele Crystal series models and above have their special programs for water softness, regulating water pressure, and dispensing detergent based on need, so your fine china can get the clean that it needs while staying protected. Wine lovers will be particularly pleased with the Miele Diamond series dishwashers that are ideal for washing quantities of wine glasses, and Miele is the only dishwasher in the US market that can wash dishes without the rinse aid to eliminate the chance of any element coming between the wine glass and the wine. Putting on a small load can often make you feel guilty, but all models from both these brands are able to run partial loads while saving water and energy. When buying a new appliance, one of the important questions on your mind is how long is it going to last. As one of the most closely integrated appliance manufacturers in the world, Miele makes nearly every single one of their machine parts themselves. In doing so, they are able to promote a 20-year lifespan for their dishwashers without any decrease in functionality. It’s easy to see that in every part from the buttons, the racks, and the wheels they glide on, that Miele dishwashers are built to last for decades. Looking at Samsung, they are a brand that has definitely improved when it comes to technical support and service calls and boast a significant service rate of less than 10%. Samsung models are made to last between 7 to 10 years. For those that want to throw a dishwasher in a kitchen (aka builders and house-flippers), the DW80M2020US is a handsome entry-level model for less than $399. We hope that you will shy away from this model as it comes with rather loud operational noise. With a little bit more cash to spend, the DW80K5050US and the DW80K7050US with 3rd Rack sitting at between $600-$749 are excellent choices for modern users who want a few more features than the budget options have to offer. You can also choose from a range of colors but do expect to pay a bit more for the pleasure of the most stylish ones. Hitting the higher price category of between $800-$1100 depending on seasonal promotions, you have the DW80M9550US and DW80M9960US, which have enough Samsung features such as the FlexTray, ZoneBooster, and WaterWall to satisfy any household. Since you’ll normally want a super quiet dishwasher operating at around 46 dB, you’ll be highly pleased with these operating between 38 and 42 dB. Miele, with an unparalled commitment to quality, certainly has some outstanding features in their dishwashers. Their price points are a clear representation of this. On the lower end of the scale are the Miele Classic Plus series dishwashers, which are ideal for the needs of most families. At $799 during promotional times. Next, at almost double the price, the Miele Crystal series start from $1499 and have the most advanced features such as the auto-open door and water softener, making this series highly convenient and a pleasure to have in any kitchen. At the high end, you can find the Miele Dimension and Lumen series dishwashers. With a starting price point of $1699, you’d expect a whole lot of luxury features, and that’s exactly what you get as well as ultra-quiet operation. The ultimate creme de la creme, the Diamond series dishwashers starting at $2499. These fully featured dishwashers come with a standard 5-year warranty. Miele also makes professional-grade dishwashers that can be used not only in your home but also for commercial or scientific use. These professional dishwashers come with an NSF certified sanitization feature, super-fast 6-minute cycles, and the ability to load with specialized racks. The Miele Futura Classic Plus is one of our favorites in this price range due to the excellent Miele standards and affordable promotional price of $799. With five wash programs and 16 place setting capacity, this stainless-steel model makes cleaning up a breeze after those hectic family dinners. You’ll enjoy making use of the 3rd rack to put all your cutlery on and have peace of mind with the double waterproof system. With a 15-place setting capacity, this Samsung model is a great buy for busy households. Stacking the dishwasher is a breeze with the FlexLoad™ Racking System and adjustable upper rack, and not only do you get lots of useful functions such as an Auto-release door and the StormWash™ System, it has a 44 dB sound level that you will not notice too much. At around $724 depending on seasonal promotions, this is honestly one of the best dishwashers you can buy in terms of the number of features you get in this price range. The Samsung DW80M9960UG sits at around $1165 depending on seasonal promotions and is extremely popular due to its black stainless color which looks fantastic in modern kitchens. As you’d expect in this high-end price range, this dishwasher is super quiet with just 38 dB performance. You get all the great Samsung features such as WaterWall™, AutoRelease™ Door, and the Zone Booster™, as well as adjustable racks that make dishwasher stacking so much simpler. So, which brand will you choose? All in all, Samsung dishwashers are great if you are buying them as part of a Samsung kitchen appliances package. Promotional savings, along with matching handles and colors will make your kitchen look great. If you are tired of your old clunker dishwasher and don't want to take any chances Miele is there for you. Still struggling to make a decision? Give us a ring. We’ll happily show you the differences between the two.